Early 1950s W.R. Lander, Chargehand Shipwright and work colleagues. This photograph was taken outside of the Marine Workshops during the early 1950's. Mr W.R. (Bert) Lander was Chargehand Shipwright from December 1927 until his retirement in 1960. He started work at the harbour in 1909. This page was added by Sylvia Woolford on 28/05/2008. I remember these chaps very well, I was an apprentice carpenter under them - lovely chaps. Bert Lander was a true gentleman, Cyril Lester still lives in Newhaven. Cyril was an apprentice I believe, in this photograph. Happy days. Grandpa Lander would be thrilled to know he was on the internet! The Templeman in this photo looks like Stan Templeman, my uncle, who later worked at the Parker Pen factory. Your are right Martin, I knew Stan very well. A very nice man. I have a clock here in Nottingham which I bought in Newhaven at the end of the last century. It was a weddng present for Mr W R Lander on the 20th of August 1904. Presented by the Newhaven Cricket Club. I have posted an image on the Newhaven Cricket Club facebook page. It would be nice to see images of the family. I showed this photo to Cyril Lester and he said the caption was wrong and requested me to try and put it right. 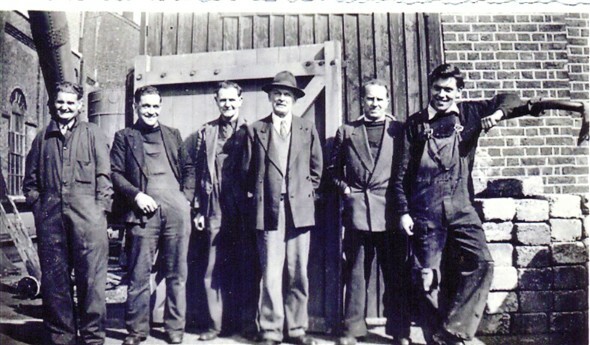 He says the man on the left described as Templeman is in fact Alf Watkins who was a labourer who came from Brighton.